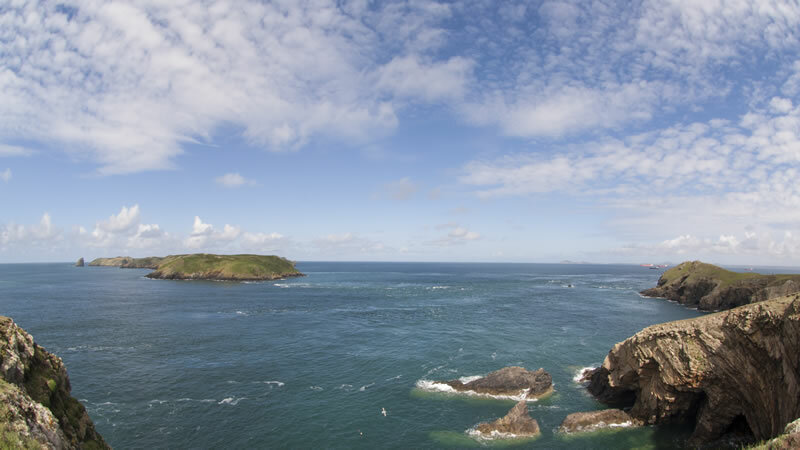 Skomer Island, lying less than a mile off the beautiful Pembrokeshire coast, is a world renowned wildlife paradise. The exposed headlands, towering offshore rocks, and sheltered inlets of this fascinating island are home to a incredible variety of wildlife, both above and below the surface. Skomer is the largest of Pembrokeshire’s islands at around 730 acres. It is owned by NRW (Natural Resources Wales), and managed by The Wildlife Trust of South & West Wales. The island was formed approximately 12,000 years ago when sea levels rose and it became separated from the mainland. It sits, effectively cut off from the rest of Pemrokeshire by Jack Sound, a narrow stretch of water, renowned for its strong tidal currents. The island’s isolation means that there are no ground predators present on the island. For for this reason Skomer has become one of the world’s most important habitats for burrow nesting seabirds. Skomer is most famous for its Puffins. 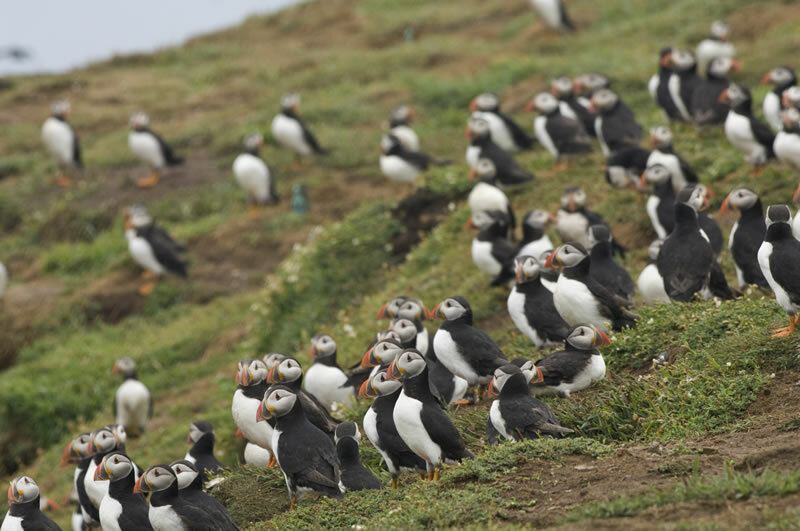 Together with neighboring Skokholm Island it forms the largest breeding Puffin colony in Southern Britain. But the Puffins account for just a small portion of the wildlife who call this island their home. With and estimated population of up to 165,000 pairs, Skomer is home to the largest and most important breeding colony of Manx Shearwater in the world! Between the Puffins, Shearwaters and Rabbits there are very few spots on the island which have not been burrowed. As such, beneath the visible surface, many parts of the island are a honeycomb of intricate tunnels and burrows. Designated paths are set out for visitors to avoid damaging any of this delicate habitat. Also present in their thousands are the Razorbills and Guillemots who line the cliff tops and ledges around the island. In addittion to this the ever present members of the gull family; Kittiwakes, Lesser Black-backed Gulls, Herring Gulls and the Greater Black-backed Gull. Larger seabirds such as Fulmars and Gannets can usually be found gliding and fishing around the island. Shags and Cormorants take up position on the surrounding rocks to dry out their wings in between fishing. Asides from the seabirds, there are large numbers of migratory birds who use Skomer as a stop-over, such as Wheatears, Swallows, and Sedge Warblers to name but a few. The island is also home to a number of resident birds of prey, with Peregrine Falcons, Buzzards, and Short-eared Owls being regular sightings. The main mammals on Skomer are Rabbits, and the Skomer Vole, a subspecies of the Bank Vole which is unique to Skomer. Rabbits were introduced in the 13th Century by the Normans, at the time they were a valuable source of food and fur. They were also the major export to the local markets on the mainland. Now there thousands of rabbits, they are the main grazing animal, maintaining the short vegetation and plant diversity. The island’s main predators are the Greater Black-backed Gulls and birds of prey. They feast on small rabbits, voles, puffins, and manx shearwater. 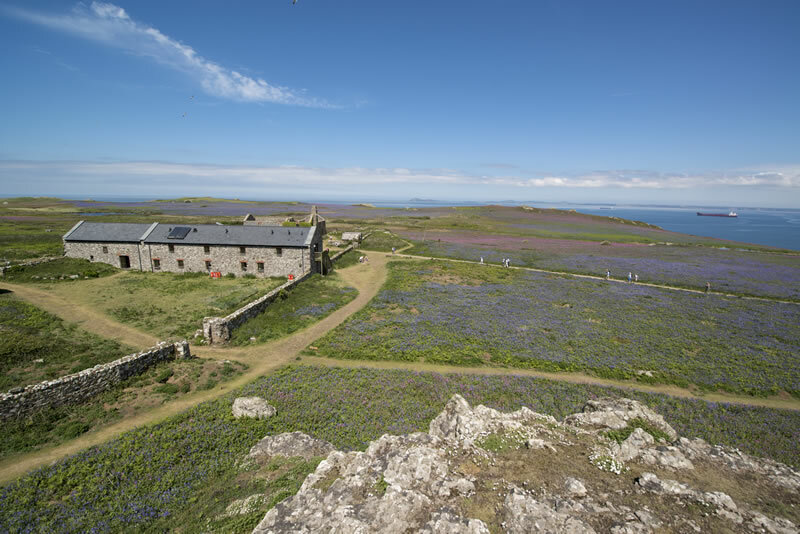 Skomer has been designated as a Site of Special Scientific Interest, and it is the first and only Marine Nature Reserve in Wales. The surrounding waters are rich in marine life, with a huge population of Atlantic Grey Seals, as well as Porpoise, Dolphins, and even Whales. Seals can be seen hauled out on the rocks, basking in the sun all year round. It’s Autumn and Spring when they can be seen in the biggest numbers. 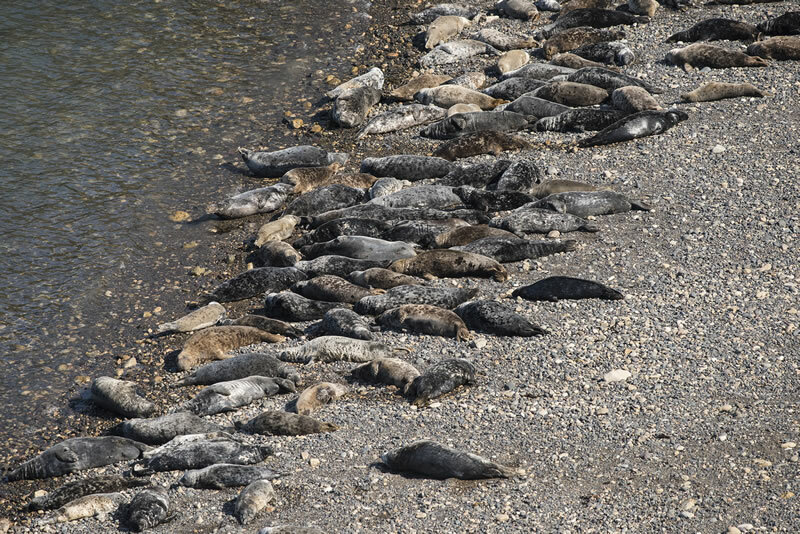 It is not uncommon to see hundreds of seals laid out on the beach in Skomer’s North Haven. Porpoise and Dolphins can regularly be seen in the tidal races around the island. As the island is so exposed, there are no trees, although willow, bramble and blackthorn scrub survive in the valleys. However, in spring the island is carpeted with Bluebells and Pink Campion, a truly magnificent sight to behold. We offer a number of different ways to experience Skomer. Land and explore the island for yourself. Take a gentle cruise through the surrounding waters, or enjoy a high speed wildlife adventure on one of our Sea Safaris. Not sure which trip is for you? Simply give us a call on 01646 603123 and we’ll be delighted to talk you through the various options.